Each soul must meet the morning sun, the new sweet earth and the Great Silence alone. The logical man must either deny all miracles or none. Charles Alexander Eastman was born in Near Redwood Falls, Minnesota. He was an American physician, social activist and writer. He educated at Boston University. In the early 20th century, he was "one of the most prolific authors and speakers on Sioux ethnohistory and American Indian affairs." 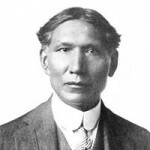 After working as a physician on reservations in South Dakota, he became increasingly active in politics and issues on native American rights, he worked to improve the lives of youths, and founded thirty-two Native American chapters of the Young Men's Christian Association. He also helped found the Boy Scouts of America. He is considered the first Native American author to write American history from the Native American point of view.